You wait all your life for the opportunity to do a Tim Tam Slam with a suitable beer then, whaddya know, two come along in quick succession. 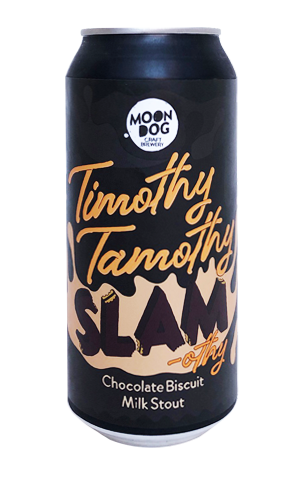 The first to land is Moon Dog's Timothy Tamothy Slam(othy), while attendees at this year's GABS will be able to check out one from Big Shed amid the Festival Beer lineup. First to try the Moon Dog version, at Crafty Towers at least, was brother-in-law Tim(othy), just arrived from the UK and having never been to Australia, heard of Moon Dog or had a Tim Tam in his life. The conclusion was that it's a little more challenging getting cooled sweet stout through a biscuit than it is hot tea, yet the effect on said biscuit was an equally welcome sogginess on the inside.